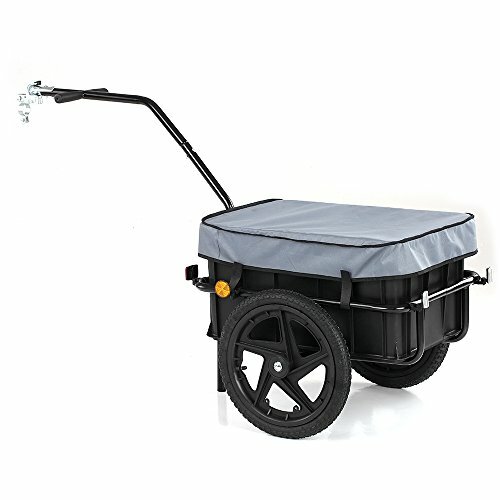 This detachable bike cargo trailer with a removable transportation box and metal frame can be attached to almost any bicycle and has plenty of space for groceries and running routine errands. Easily to assemble and fold down for storage with powder coated steel frame. Removable 70L transportation box, large capacity & maximum loading weight up to 110LBS. Foldable metal frame, space saving with quick release wheels. Including a removable cover, waterproof for light rain. One bicycle hitch / connector included, universal for most bikes. Includes 2 white reflectors at the front, 2 red reflectors at the rear, and 2 yellow reflectors on the sides. 1. This trailer is not for children. 2. Please make sure all screws are tightened before using.